For those with special health needs, mineral supplementation can be a matter of extreme importance. Research suggests that the form of your supplement can be as important as whether you take it or not. 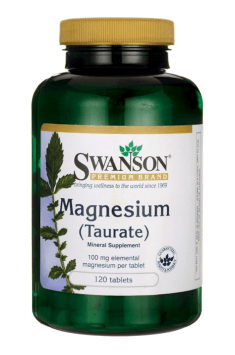 When it comes to magnesium for heart health, choose Swanson Premium Magnesium Taurate. Taurine and magnesium work together inside the body and, while they depend on each other, they each have independent and important roles. Magnesium Taurate delivers both vital nutrients in a fully reacted dietary supplement complex. As a dietary supplement, take two tablets two times per day with water. Bulking agent (Microcrystalline cellulose, Stearic acid), Stabilizer (Sodium carbohymethylcellulose salt), Glazing agents (Shellac), Anti-caking agent (Magnesium salts of fatty acids, Silicon dioxide). A combination of three synergically active forms of vitamin K and vitamin D3. Magnesium taurate is an amino acid chelate which is a combination of magnesium and taurine. This means that this form is a source taurine, an anion required for the normal functioning of the body, apart from the essential magnesium. A unique combination of magnesium with taurine does not only enhance bioavailability (taurine promotes magnesium transport through cell membranes) but also has a positive effect on our body, especially the cardiovascular and nervous system. Magnesium aids in normalising blood pressure and shows anticoagulant, antiarrythmic and antiatherosclerotic properties. Like magnesium, taurine reduces blood pressure and optimises cardiac function. In addition, these substances help increase insulin sensitivity and reduce the risk of micro- and macrovascular complications of diabetes. Magnesium taurate supplementation is thus a perfect solution for individuals who want to support their cardiovascular system (problems with hypertension, insulin resistance, diabetes, arrythmia) and nervous system.